Dicalcium Phosphate, Powdered Cellulose, Stearic Acid, Magnesium Stearate, Croscarmellose Sodium, Chromium Picolinate. †these Statements Have Not Been Evaluated By The Food And Drug Administration. This Product Is Not Intended To Diagnose, Treat, Cure, Or Prevent Any Disease. Do Not Use If Printed Seal Under Cap Is Broken Or Missing. Diabetics/hypoglycemics: Use Only Under A Physician's Supervision. Keep Out Of The Reach Of Children. 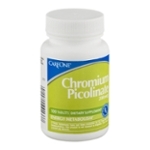 Chromium - 200mcg - 16%.